when I try to open my EMC9DS full version it will not open -the splash page appears on my desk top and just sits there. It use to work and not it won't load!!! I have Vista home and my pc is only a few months old. Is it the Home screen you can't get to work? What happens if you use the Start/Programs button and open the individual applicatiions? Does that work? Id' try a repair install and that should fix it. What is EMC9DS. Does the DS signafy that this is the download version? I thought the designation was ESD. Did you do the update to 9.1 for Vista? I believe the poster means 'Deluxe Suite'. But if it was working before, obviously something was installed or done to have an effect on the program. I have the very same problem. Roxio EMC 9 was working fine last night (12/4/2007). Today, it won't even open. At all. I've tried it from the task bar, I've tried it from the icon on my desktop, I've tried it from start/all programs. Nothing. I'm operating Vista Home Premium. On the task bar is an icon for the Roxio Media Experience. That briefly opens the splash page, then shuts down. So, I can't even open it to see whether I have the 9.1 upgrade. A previous email talked about a repair install. How is that accomplished? I have the dvd's I burned from a web download. 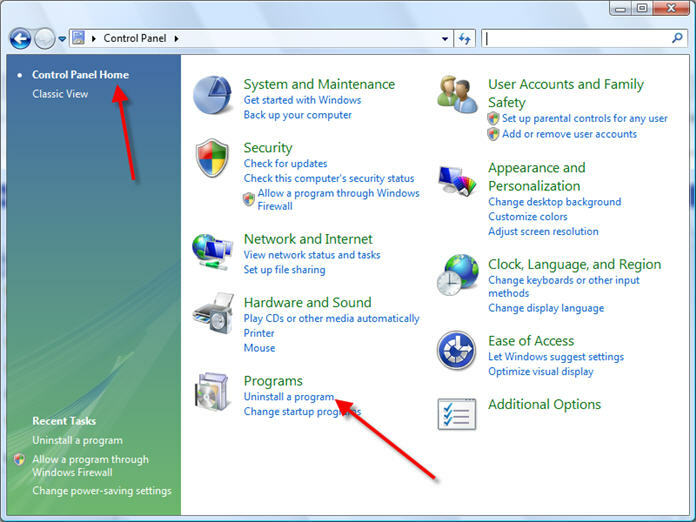 To do a repair install in Vista, you need to go into the Control Panel and then choose Control Panel Home then the Uninstall link. On the next section, find EMC9 and highlight it then choose Repair. You may need your disc as well. However, repair is looking for an msi file, which doesn't exist, and the installation CD (it is EMC 9.1, incidentally) contains but one file - that just spins the cd/dvd drive and never opens. Now, as far as I know Drag-to-Disc works just fine (at least it comes up at boot time), but no other Roxio application opens. I tried "installing" from the CD on another Vista computer, and the same thing happens there - the .exe, called 1Z22TZX0R03_ECMSuit9.1efigsd.exe does nothing but spin the drive. It never opens. I'd go ahead, uninstall (assuimg I can) and re-install, but I don't have an executable or an msi to do the install. Wes, sorry for stating the obvious......I can say that if you're running Drag to Disk in Vista, you're one of a very small number doing so. Drag to Disc is not compatible with Vista and in fact, if you update to 9.1, it should nuke it from your system. I'd suggest you at least uninstall D2D. promising liberty and justice for all. still no luck...I tried to unistall the D2D and that sat there for the longest time until I canceled. Now I am in the process of downloading 9.1 update and will see how this goes. Gee, "Thill", that was one thing I had no problems with. But then on the dvd's I burned from Roxio, I saw that I had 9.1. Did you, by any chance, download any recent updates from Microsoft, like Windows Defender updates, or other security updates from them? I found that link shortly after posting my follow-up. It definitely was worry-making (since Vista seems to be so touchy anyway). But, I bit the bulletm, figuring that if it didn't work, I'd be no worse off. Some of the msconfig responses weren't *quite* as listed, but they were still recognizable. And it worked. And I KNOW for certain, now I'm running 9.1 as well. In any case, thank you for posting that link! "Thill", try it. It most likely will help you, too. "Panic, chaos, disorder! My work here is done!" download any recent updates from Microsoft, like Windows Defender updates....YES!!! And now my splash page won't even open! I unistalled the whole danm program....looking for a refund! I unistalled the whole darn program....looking for a refund! You uninstalled Defender? Good move, since it may have caused all of your problems with Roxio. I did reinstall and it worked for 6 days now it won't open again! How do I unistall windows defender? I can't find it. OK I maybe wrong just a suggestion but for those 6 days were you connected to the internet? Now are you? I had this problem in Vista home premiun with emc9 the clean install and the update to 9.1 plus uninstalling napster burn engine cleared all the errors and crashes. plus roxio not opening without an internet connection. mine WAS A BOXED RETAIL VERSION. Your Not going to believe this one.... I clicked on the icon today and it opened!!!! Now I'm not going crazy or anything...but what the F? thanks for everyones suggestions! I'm sure I'll be back! Same problem here. 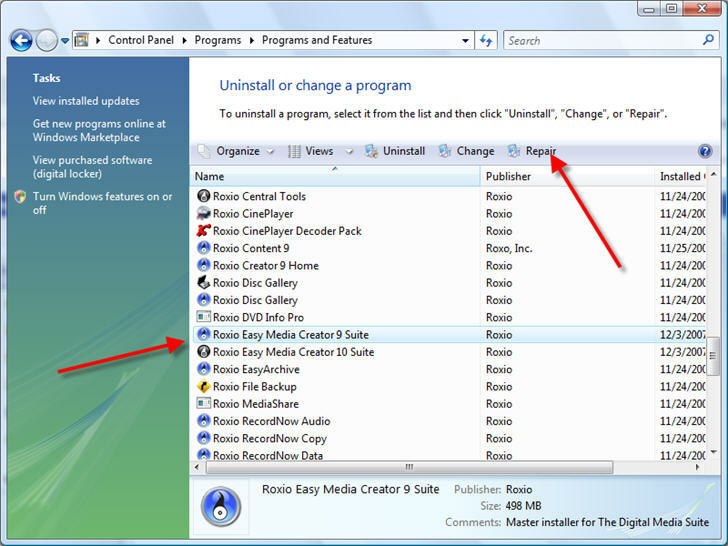 Using Roxio Easy Media Creator 9 on Win XP SP 2 on a Dell Inspiron 9400 laptop. It used to work fine but about 3 months ago, it just decided to quit opening for me. EMC9 works just fine on my Dell Dimension desktop with Win XP SP 2, however. Has anyone found a reasonable fix for this yet? The comments over at this PCMag.com review have me concerned that EMC is just a POS. Bummer - I kinda liked it when it worked. You need to list your computer specs. The software may not be the POS. Now, keep in mind that EMC used to work on the Dell laptop. It only failed in the past couple of months which MAY coincide with an IE7 "upgrade" but maybe not. Also, I'm using IE7 on my desktop so I can't see where that would be the culprit. Anyhow, as a web app developer, I can't uninstall IE7. I'm currently going through the Clean install process. I'll let you know how it turns out.